Kit Kat recently advertised with Unique Instore Display at Qatar Airport in the Duty Free Zone. Kit Kat is a chocolate biscuit bar, which was invented in England and is now produced by Nestlé. Such promotional set up is great to catch the eye of current or potential customers and to boost not only your sales but also your brand attention. To promote with POS Displays is a usual way to catch the attention and eye of the customer, that is why you need to think about a unique way to promote your brand with a POS Display. Kit Kat has advertised with a lot of different promotional products and items before. But this Unique Instore Display not only great because of the bench in front, but also because of the big banner in the back and the unique shape of the shelves. The Round design of the shelf in the back is great, as this will allow that the customers can take the goods from every side of this shelf and will not stand in the way of each other. The other shelves with a back allows to focus the view of the customer to a certain amount of products and will boost your sales on these certain products. Also the bench is a great and eye-catching promotional product to use in such a unique Instore display. The phrase “Social Break” fits perfectly here to the product, as you usually break the chocolate biscuit bar too and it is a fun-affect too. 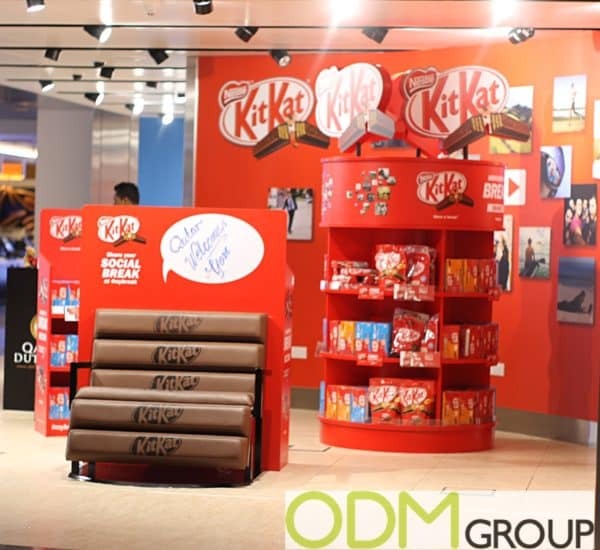 Also the possibility to have a rest on the bench while shopping or enjoying the Kit Kat bars is a great idea and will attract a lot of customers. Why should you think about a Unique Instore Display? Brand awareness. To promote with such a unique Instore Display will gain your brand awareness and attention. Your customers will talk about your advertisement, while they are in any supermarket or shop and buying your product. Your customers will take picture while siting on this bench and will gain you a lot of brand awareness through the social media, which is free marketing for your brand and campaign. Additional Customers. Such a unique Instore display will not only attract current costumers during the campaign, but will also attract potential customers to sit down on such a bench and to try this product. This is a good way to convince potential customers by your brand, which will help you for a long term. At ODM we have significant experience in product design, sourcing and manufacturing. We can help you with your marketing budgets effectively. Be sure to contact us if you are interested in finding out more information about a Unique Instore Display. Please find Unique Instore Display related links below.